Put your notes on your home screen with the widgets from Note list. Note list comes with two widget variants. The first widget shows your note content and title plus a new note icon so you can quickly create new notes from your home screen. 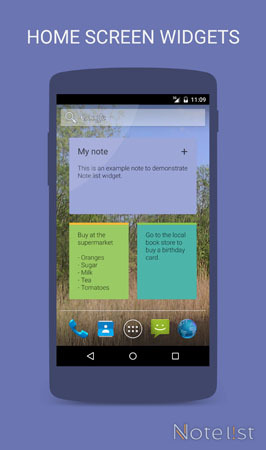 The second variant is made to be a compact version which only shows the content of your note. Both widget variants are scrollable, so you can also use them to display longer notes and support the note's text markup. The widgets come in multiple colors and all of them are resizable. To learn more about Note list's features, click on one of the subjects below. © 2005-2016 Martin van Zuilekom, unless stated otherwise. Android, Google Drive, Google Play and the Google Play logo are trademarks of Google Inc.